Ecovative, a startup that made a name for itself with its sustainable packing and building materials made from mushrooms, is planning a pivot into lab-grown meat and other areas. The company wants its mushroom scaffolding to be a central material for startups aiming to create everything from clothing to meat without slaughter. The material could have uses for plant-based “meat” companies like the Bill Gates-backed bleeding veggie burger startup Impossible Foods, too. It might sound like an odd pivot. 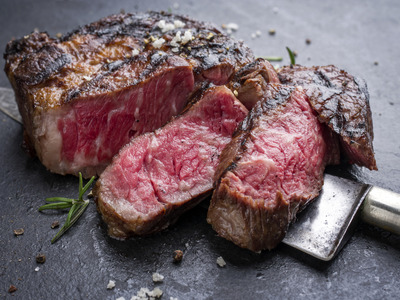 But a critical obstacle for the “cell-based” (or “clean”) meat industry is taking the raw materials for meat – lab-grown cells from the fat and muscle tissues of chickens, pigs, and cows – and crafting them into materials that mimic the complex structure and texture of a marbled steak or sinewy chicken breast. Several startups in the space claim to have succeeded in making prototype products that take the form of sausages, burgers, and meatballs. But these products involve essentially smashing together a mix of muscle and fat tissues – not creating actual pieces of flesh that mirror the real thing. What could be missing is a good scaffold, a delicate structure on which the cells can thrive. Using a new platform which the company is calling MycoFlex, Ecovative will be able to tailor a foam-like product it makes from mushroom roots (or mycelium) and craft it into a variety of end materials, from performance foams for clothing and shoes to cellular scaffolding for lab grown meat. In April, the company worked with licensee and fellow startup Bolt Threads to make the first MycoFlex-enabled product, a leather-like bag made with material it called Mylo. 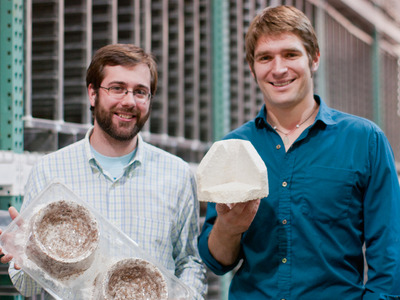 Ecovative’s mushroom-powered structure could have uses beyond the cell-based meat space as well. In the plant-based food arena, for example, mycelium could be used as the foundation for new, even meatier versions of already popular vegetarian items like the Bill Gates-backed “bleeding” Impossible Burger or the Beyond Burger. Wild Earth, a startup making vegan dog treats, uses koji – the fungi that gives soy sauce and miso soup their umami kick – in its products. Similarly, startup Terramino Foods is exploring using koji as the central ingredient for its “salmon” burgers. For now, Ecovative isn’t sure which path in the sustainable food arena – whether it’s cell-based meat or plant-based meat alternatives – the company will end up pursuing the most heavily. The company’s overarching goal is to make its mycelium design platform available to everyone, Bayer said on Tuesday at a launch event hosted by global science conference SynBioBeta. Regardless, Bayer said he sees a place for his company at the food-of-the-future table.